BIG RINGS: Fez Sepic and with a large calamari from Swan Bay. The entrance to Swan Bay fished very well for small snapper, trevally, squid and big flathead over the past week. Michael Moore fished the entrance over the weekend, catching plenty of fish on the four-inch Gulp Nemesis soft plastic during the incoming tide. Clifton Springs remained one of the go-to spots for anglers chasing snapper. Fresh baits like squid, pilchard and silver whiting rigged as lightly as possible were the best options. Peri Stavropoulos and Fez Sepic fished out of St Leonards where they caught gummy sharks, snapper and flathead. Drifting with the use of a sea anchor in 23m of water helped the pair catch salmon and squid, while they also boated a 2m-plus seven-gill shark and lost a few others. 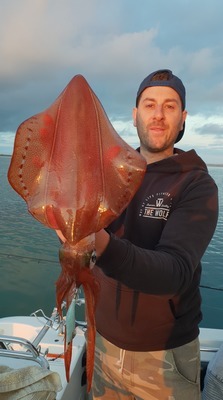 Squid fishing was again on fire right along the Bellarine Peninsula, with the bigger specimens still being caught in the Lonsdale Bight on white artificial or baited jigs with silver whiting. Offshore fishing began heating up, with snapper, gummy sharks and massive salmon to 3.5kg caught. Fishing the recent calm conditions on warm days made spotting the feeding salmon easier, with metal lures or soft plastics cast into the schools of fish almost always scoring a hook-up. Barrel tuna were on the chew at Port MacDonnell and Portland, where skirted lures accounted for fish over 100kg. Aire River opened only a few days ago, so the river’s recent good fishing should only get better. As the water level recedes, the bream really come on the bite and will respond well to small grub plastics or 40mm to 50mm minnow lures, while anglers using bait will find success with small yabbies or scrub worms. The Barwon River produced carp to 5kg around the Breakwater bridge area over the past week. Casting bread squeezed onto unweighted hooks was highly effective when used in conjunction with a light berley. Some great reports came in from Lake Eildon where Murray cod and yellowbelly were on the bite. Casting spinnerbaits and mumblers around trees and rocky edges accounted for some very solid fish.